Angel Hernandez, gimme a break. The worst umpire in baseball. You can find a better ump at your Little League game. 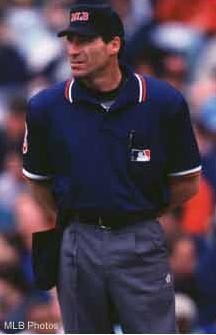 On July 5, the New York Mets lost a 3-2, 11-inning contest to the Braves when umpire Angel Hernandez called Atlanta's Michael Tucker safe at the plate on a sacrifice fly even though the ball clearly beat Tucker to the plate and catcher Mike Piazza appeared to get the tag down. He calls the most strikes in the majors in 2000 according to the Ultimate Jays. The biggest roadie in the league? Angel Hernandez with a 22-12/+1420 record for the vistors. The Cubs' chaotic evening started in the sixth. The Cubs thought they had tied the score 2-2 in the sixth when Ron Coomer slid home on a wild pitch. But home plate umpire Angel Hernandez ruled Coomer was out. "I was safe," said Coomer. "[Pitcher Denny Neagle] tried to block the plate, and I pushed him away." The crowd of 40,266 booed until former Bears defensive tackle and pro wrestler Steve "Mongo"McMichael grabbed the microphone in the seventh inning. "Don't worry about that call at the plate. 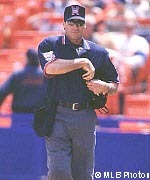 Mongo will talk to the ump after the game," McMichael said before singing "Take Me Out to the Ballgame." The message incited the crowd and infuriated Hernandez, who ejected McMichael. Even after a late-inning rally and a night of sleep, Manuel was still equally adamant that home plate umpire Angel Hernandez was wrong to overturn a home run by Wil Cordero, which led to Manuel's ejection. Cordero hit a towering fly ball down the left-field line that third base umpire Marvin Hudson ruled a home run. After Cordero completed his trot and returned to the dugout, Hernandez changed it to a foul ball. "You can't have the umpire changing the strike zone in the eighth inning," Rhodes said. "I threw some good pitches, and I didn't get the calls." Rhodes wasn't alone in that assessment. Catcher Dan Wilson, who offered a mocking laugh when the subject of the strike zone came up, would offer only a "no comment" when pressed. Early in the game, Hernandez's strike zone was as wide as the Bronx. By the time Rhodes showed up, it looked like Weight Watchers' most successful graduate ever. "To be honest with you, it seemed like the strike zone kept shrinking and shrinking," shortstop Alex Rodriguez said. "Arthur threw some damn good pitches, but they kept squeezing him." Seattle southpaw starter John Halama, who limited the Yankees to four hits in his six shutout innings, and pitching coach Bryan Price both discussed the apparently inconsistent strike zone of home plate umpire Angel Hernandez. New York lost another coach � albeit briefly � when Cookie Rojas was ejected in the third inning for arguing that third-base umpire Angel Hernandez should have called a balk. Benitez threw a 96 mph fastball on the outside corner. Home plate umpire Angel Hernandez froze before calling it a ball, high and outside. Mets reliever John Franco, catcher Mike Piazza and manager Bobby Valentine argued vehemently with plate umpire Angel Hernandez following his safe call. 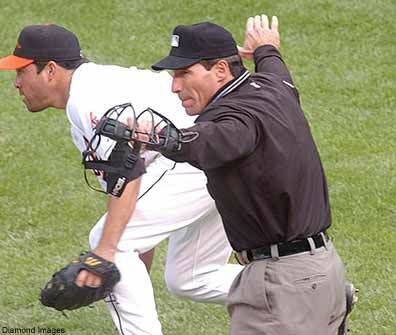 In Devon White's three years in the National League, one man consistently has gotten him out: umpire Angel Hernandez. White has been ejected from three NL games, all by Hernandez, who completed the hat trick after calling White out on strikes in the first inning last Friday night. White, a 13-year veteran, said all of his run-ins with Hernandez have been as a result of called strikes. 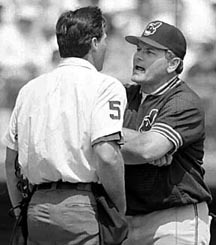 Mike Hargrove continues to argue with home plate umpire Angel Hernandez during the start of the second inning after Hernandez kicked a bat left at home plate by Kenny Lofton on a close call strike three in the first inning. "That (kicking Lofton's bat) was the most unprofessional thing I've ever seen an umpire do. "He said that Kenny was trying to show him up when he dropped the bat. I told him that's what he does when he walks, but he couldn't get that through his head." Major League Service Time: 10 Years. hobbies include boating, fishing, motorcycles, scuba diving, golfing and weightlifting.